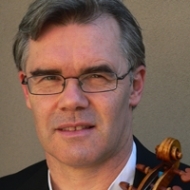 Menuhin School, Guildhall and Juilliard trained Adelaide born violinist Paul Wright has performed with leading ensembles and orchestras in Australia and overseas. Paul has recently returned from the Australian National Academy of Music (ANAM) in Melbourne where he held a position on the teaching faculty for eighteen months. Highlights during his time there included performances with the Australian Chamber Orchestra and the Melbourne Chamber Orchestra, performances as director of the ANAM chamber orchestra at the Huntington Festival, and an evening playing with renowned gypsy violinist Roby Lakatos! He enjoys a continuing relationship with ANAM and will collaborate in future projects at the institution. Paul is deeply involved in the performance practice of music from the 18th and 19th centuries and performs in numerous early music ensembles throughout the country. Paul is currently Director of String Studies and Winthrop Professor in the School of Music at the University of Western Australia where he enjoys an active life in teaching, research and performance.